All references now have a tab where you can see all the connections that reference has. 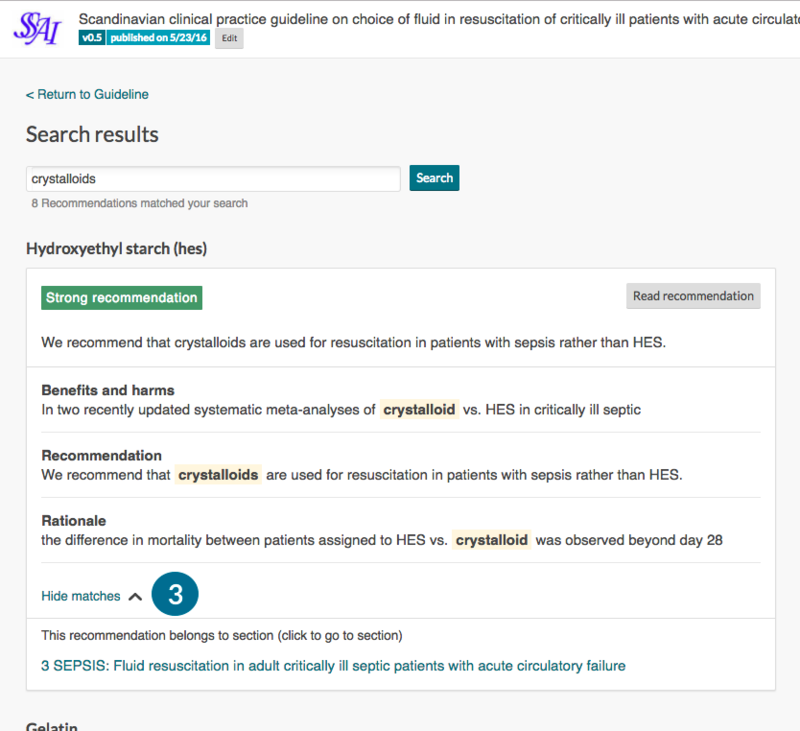 You get a list of all the Recommendations, PICOs, and outcomes where the reference is used, with a shortcut to get to the items. We hope this will make updating references and study data easier. You can open up the PICO and outcome in a pop-up to take a look at it without moving away from the tab. In collaboration with Epistemonikos, we integrated with the interactive Evidence to decision framework (iEtD) developed through the DECIDE project. You can now establish iEtD frameworks from the option menu of all PICOs. 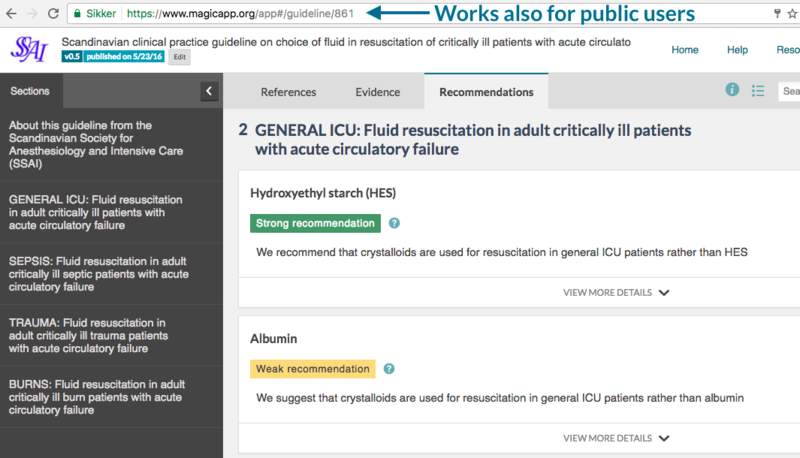 All authors in the guideline get access to edit and vote over decisions. 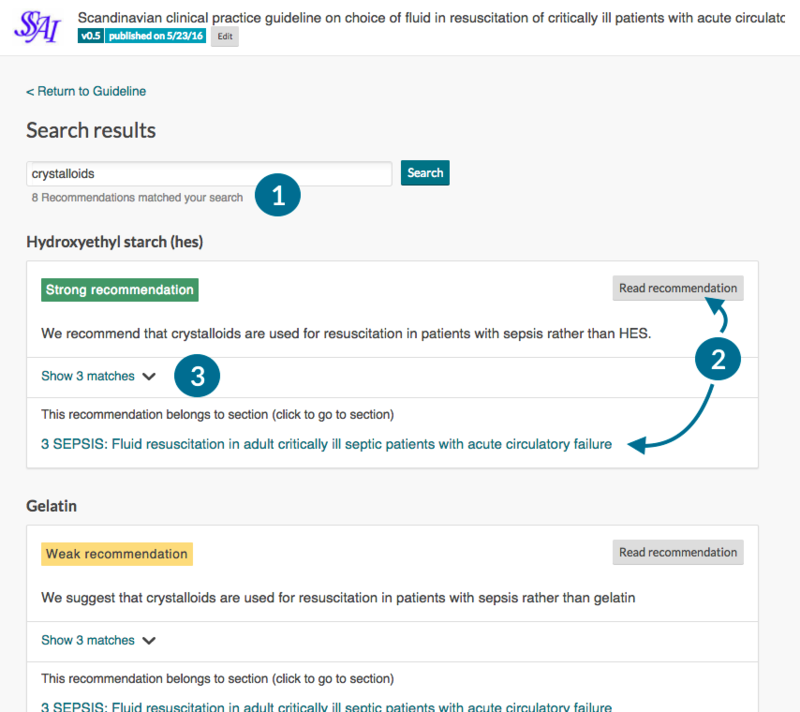 This integration was put in place some months ago, but we have made some improvements on the access, and we only now start to see it be implemented into guideline work. We would be very happy to collaborate tighter with groups that start to use this feature, and any feedback is most welcome. We have added a visual cue in the Table of contents of where you are reading or editing at the moment. 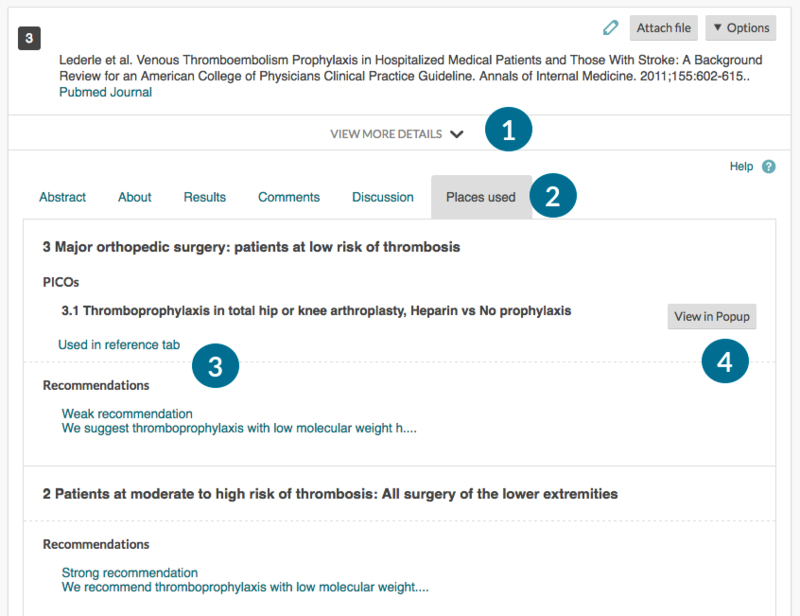 This feature also keeps you within the same section when you swap between Recommendation, Evidence and Reference view. In the image below you can see that the place where you are reading at the moment is highlighted in the table of contents (1). When you scroll to another section and stop to read, this highlight will move to the new section. 1. Better search layout inside guidelines. 2. RevMan files now imports all special characters. We ask you to use the latest RevMan version, as older versions sometimes use a different coding and it is not possible for us to tell the different files apart. 3. Public guidelines can be accessed directly using any link, without getting a login-request. 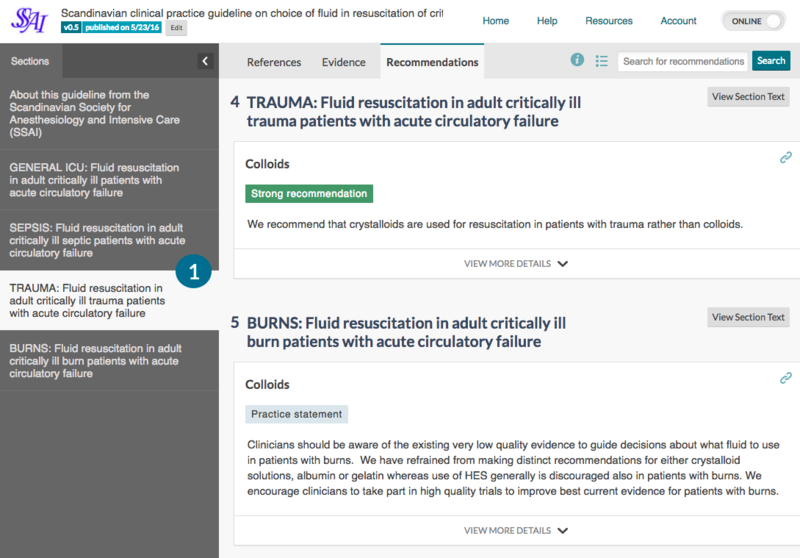 That means you do not have to use the link to the most recent version as before, you can also use the link that contain the specific ID of a guideline version. The guideline must of course be set public before a user without special permissions can access it. That said, the link to the most recent version is still the best to use, as it will always take your users to the most updated version, and not a specific version that gets outdated when you update. When your session times out, you now get a login pop-up instead of being taken to the login page. That means you can more efficiently resume the task you did before your session timed out, without having to navigate back. The PDF-generator on guideline listing page did not work, only the PDF generator inside the guideline worked. It's fixed. Signup of users failed with some Internet Explorer 10 browsers. It's fixed. In search view the Against recommendations did not have colour on the strength label. It's fixed. In PDF the practical issues had the same icon. It's fixed. In org control admin status of new members were not saved. It's fixed. When adding references in text as citations and re- ordering the references there was a space added between the text and the citations. It's fixed.